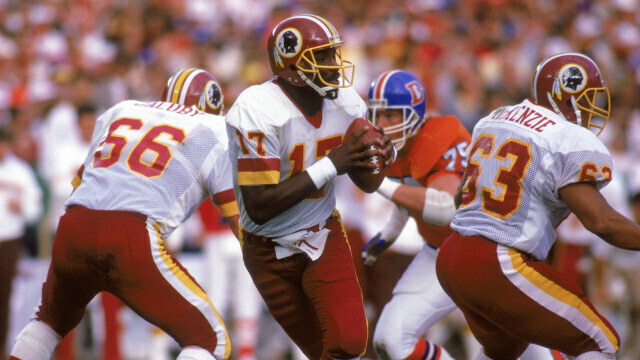 The Redskins defeated the Broncos by the score of 42–10, winning their second ever Super Bowl. The game was played on January 31, 1988 at Jack Murphy Stadium in San Diego, California, the first time that the Super Bowl was played in that city. Williams, who was named the Super Bowl MVP, completing 18 of 29 passes for a Super Bowl record 340 yards and four touchdowns, with one interception. He also became the first player in Super Bowl history to pass for four touchdowns in a single quarter, and four in a half. Williams was the first African American starting quarterback to win a Super Bowl. The 10-point deficit remains the largest deficit overcome by a Super Bowl victor.